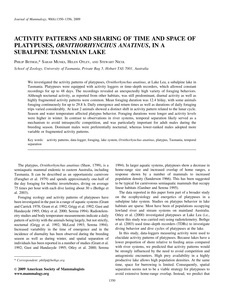 We investigated the activity patterns of platypuses, Ornithorhynchus anatinus, at Lake Lea, a subalpine lake in Tasmania. Platypuses were equipped with activity loggers or time–depth recorders, which allowed constant recordings for up to 48 days. The recordings revealed an unexpectedly high variety of foraging behaviors. Although nocturnal activity, as reported from other habitats, was still predominant, diurnal activity as well as highly fragmented activity patterns were common. Mean foraging duration was 12.4 h/day, with some animals foraging continuously for up to 29.8 h. Daily emergence and return times as well as durations of daily foraging trips varied considerably. At least 2 animals showed a distinct shift in activity pattern related to the lunar cycle. Season and water temperature affected platypus behavior. Foraging durations were longer and activity levels were higher in winter. In contrast to observations in river systems, temporal separation likely served as a mechanism to avoid intraspecific competition, and was particularly important for adult males during the breeding season. Dominant males were preferentially nocturnal, whereas lower-ranked males adopted more variable or fragmented activity patterns.